End-to-end email encryption for secure communications with anyone. A lot can happen on the digital path from sender to recipient. Hackers are finding more ways to intercept and scan emails for sensitive or confidential information, so it's important to take the necessary precautions. To ensure your emails are always private, especially those holding confidential information, you want to protect your cyber presence with an advanced end-to-end secure email encryption. LuxSci's SecureLineTM provides an encrypted and secure solution for emails to be sent from any customer to any recipient. SecureLineTM is a comprehensive, easy-to-use email security solution for mobile devices, desktop applications, and LuxSci's WebMail. SecureLineTM is also HIPAA (Health Insurance Portability and Accountability) compliant, making it the perfect solution for medical and health care professionals when sending ePHI messages. LuxSci's SecureLineTM is a simple, secure email system for advanced email security. There is no special hardware or software needed, and there is nothing your recipients need to install. SecureLineTM is linked with the SecureSend Portal, our free web-based service that allows anyone to send you encrypted emails for free. SecureSend works independently of your their email systems inherent security or lack thereof. Our flexible settings give you control over the encryption method for your secure emails. Send outbound mail with TLS, PGP (PKI), S/MIME (PKI), or ESCROW encryption. You can receive emails from any program or web service, and you can select a different method of encryption for each recipient as appropriate. LuxSci's SecureLineTM is a quick and user-friendly service that can keep you out of harm's way on the web. 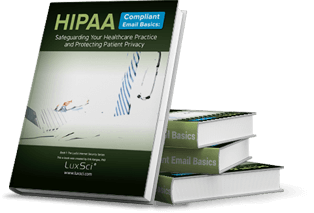 I LOVE your HIPAA-compliant services...I tried several before I found LuxSci, and they didn't hold a candle to yours!!! I am a VERY satisfied customer!"